Shabir Ahmad Mir, 27, is a self-made man. His journey from small Najan village in Beerwah, Budgam district, to Srinagar’s Kashmir University and beyond, is full of intricacies. A look at his resume and you will know why Shabir is special: qualified JKSLET (in 2013), NET, GATE and UPSC (in 2015). With Shabir’s kitty full of options, he aspires to become a geoscientist. But that is not all. Shabir can do Sozni work on Shawls with equal ease! “I started working on Shawl alongside my parents when I was in class 5. But it was purely for fun-sake then,” says Shabir. Within a few months, much to the discomfort of his father, who wanted him to study, Shabir has attained near perfect with needle and Shawls. His first earning was Rs 25. After his father’s intervention, who didn’t want his young son to lose his eyesight, Shabir quit Sozni work. But a few years later, Shabir’s father fell ill, and the burden of running the household fell on his young shoulders. “Both my father and mother are handicapped. They cannot move without crutches. So I had to do something for our survival,” says Shabir. Shabir’s younger brother was too young to be pushed into Sozni work that has shattered many dreams in this village. “Despite his illness my father was reluctant to let me do Sozni work. He allowed but on one condition, ‘you will never leave your studies’,” recalls Shabir. Thus began Shabir’s next innings with needles and Shawls. “This time it was different. It was not for funsake like earlier. I had to work, earn, and feed my family,” says Shabir, who started with five hours a day routine. Within few months, Shabir had to rearrange his timings: up to nine hours a day, as bills of his father’s medicine started mounting. “I could feel the stress in my eyes. I would study at night and work all day,” says Shabir. Shabir would earn around Rs 100 a day by working sixteen hours at a stretch to complete a Shawl. “For me it was a huge amount. By now I have learned how to survive within limited resources,” says Shabir. However, it pained Shabir’s father Abdul Rahim Mir, 55, who wanted to send him to a boarding school, to see his son drain himself out for sake of family’s welfare, but there was no other option. “I took Sozni work because it needed no investment and could be done from a small space. It suited me. I was able to study as well,” says Shabir. But there were times when Shabir had to make difficult choices. “The choice was between survival and dreams,” says Shabir. During his class 10 examination, the agent who used to give work to Shabir came up with an extraordinary request: ‘you have to finish this Shawl within two days. It is important’. Shabir worked throughout the night at a neighbour’s house, where other Sozni artists would assemble to work under a voltage bulb, and delivered the Shawl on time. “I was the only kid in that group. They all would respect me for my dedication,” recalls Shabir who went on to pass his class 10 with good grades. After clearing Class 10 exams, Shabir started putting extra hours so that he can save enough money to join college. “I literally worked round the clock,” says Shabir. During those tough times, Shabir would get up at 6 am and work straight up to evening. Then after offering prayers, he would start working on the Shawl once again till midnight. “Sometimes, when I needed extra money, I would work till early hours of the morning,” recalls Shabir. After passing his Class 12 exams Shabir wanted to try his luck in competitive exam and become a doctor, but once again livelihood came in way. “I couldn’t appear in entrance test even once,” says Shabir with a hint of disappointment in his voice. Instead he joined college in Srinagar. “I calculated that MBBS would cost me a lot which I was not in a position to bear. So I dropped the idea,” says Shabir. College life was difficult for Shabir as he had to shuffle between his village and Srinagar regularly. “I used to rush back home after college everyday to help my handicapped mother with household chores. Then afterwards I used to sit down and work on Shawls,” says Shabir. Other reason for skipping college on and off was his inability to manage bus fare, Rs 7 a side. The bus would drop him at Batamaloo stop, some two kms from his college, from where he would walk. “My limit was Rs 15 a day. After bus fare I would have just one rupee left, meaning no lunch or tea during college hours,” says Shabir. After graduation when Shabir joined Kashmir University to pursue masters in geology, another challenge was looking at his face: how to manage expenses? “It was not like college, books would cost thousands of rupees. Then there were other expenses as well,” says Shabir. To manage his expenses Shabir, who along with a friend was living as tenants near the campus, started doing odd jobs after classes. But even during most difficult times Shabir never thought of leaving studies. 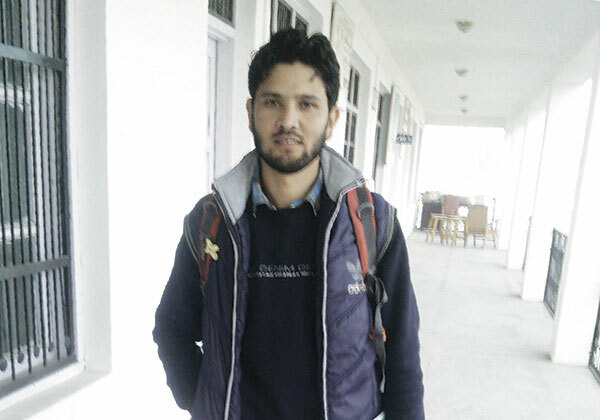 “After all I had promised my father that I will never leave my studies midway,” says Shabir. Once back home from university Shabir would keep his books aside and take a needle and start working on the Shawls. “This way I could manage my books, fees, bus fare etc,” says Shabir. In second year of his post graduation Shabir had to visit Karnataka with his classmates for a month long field trip. Though, the trip was sponsored by the department, every student was supposed to bear cost of his/her meals on their own. Shabir took Rs 3000 along. “I told myself that Rs 100 is my limit for the day,” says Shabir. But life in Karnataka proved quite costly for poor Shabir, as breakfast and two simple meals would cost at least Rs 200. Around same time, another challenge was looking at young Shabir’s way. His mother Syeda Bano, 52, had to undergo an emergency surgery. This unexpected situation drained Shabir of all his savings. “I worked round the clock to manage the expenses,” says Shabir. Once out of university, Shabir started working with a local private school earning Rs 1800 a month. “Even that was huge amount for me. I had managed my house for just Rs 1000 a month,” says Shabir. Next Shabir got a job to teach at degree college Baraumallah on contractual basis. “This earned me Rs 18 thousand a month, a ten-fold jump,” says Shabir with a smile on his face. In the meanwhile Shabir qualified JKSLET, NET, GATE and UPSC. After qualifying UPSC, Shabir is set to go on a nine months training in June 2016. “I qualified as geoscientist,” says Shabir with a smile. absolutely inspirational one but one thing is missing in his life that is not to respect the feelings of others…. Your comment…no words to describe shabir ,,, salute to you brother for your dedication, hardworker & your innocence…..
Really inspiring. ..Salute to him…..